A sanitation truck struck and killed a cyclist while making a turn in Center City Philadelphia Tuesday morning. 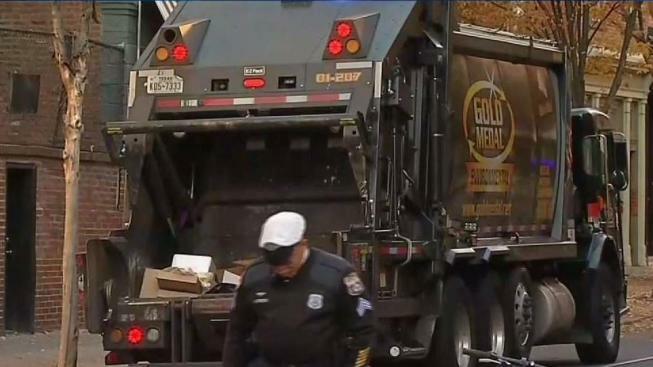 The privately-owned trash truck and 24-year-old Emily Fredricks were both going along Spruce Street when the truck turned onto 11th Street and struck the woman around 7:25, Philadelphia Police Capt. Sekou Kinebrew said. Fredricks was rushed to nearby Jefferson University Hospital where she died a short time later, Philadelphia police said. She lived nearby along the 700 block of South Street. The Gold Medal trash truck stopped along 11th Street after the crash and the driver cooperated with investigators. Police spent three hours investigating the wreck. The roadway reopened around 10:30 a.m.
A trash truck struck and killed a woman riding her bicycle Tuesday morning at 11th and Spruce streets in Center City. Spruce Street, a one way street westbound, has a dedicated bicycle lane on the right hand side. It wasn't clear if the cyclist was in that lane. 11th Street goes one way northbound. Fredricks was headed to work as a pastry chef at the time, friends told NBC10. Kinebrew said that further investigation would be needed to see if any traffic violation or other charges would be filed. He didn't know if the cyclist was wearing a helmet. Fredricks' death puts a spotlight on cycling safety in Center City where cars, trucks, buses and bikes share the road daily. The Bicycle Coalition of Greater Philadelphia planned a 5 p.m. Wednesday vigil at the site of the deadly crash in the memory of Tuesday's victim and everyone else killed in traffic crashes in the city. The bike coalition says three cyclists have died this year. "Just being one (death) is significant enough to, at least, look at what happened and maybe see what can be done to make sure things like this don't happen again," Kinebrew said. To put a spotlight on bike lane safety, cyclists, pedestrians and motorists planned to link arms along the Spruce Street bike lane around 7:30 a.m. Wednesday. Gold Medal didn't reply to requests for comment.